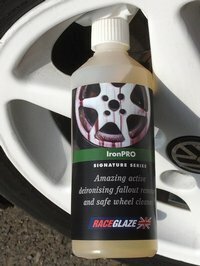 Race Glaze IronPRO is an amazing, active deironising fallout remover and safe wheel cleaner. It has a brilliant capacity to react with bonded on brake dust particles and prove it is working by turning them purple as it dissolves them. This leaves remarkably clean wheels, without black brake dust stains. It has been independently tested and considered safe on most types of wheels. The technical process is as follows: high temperatures generated by wheels bond iron-rich brake dust particles and road debris to wheels and adjacent bodywork. IronPROs´ ph neutral formulation contains chemicals which reduce the sintered iron into a purple coloured water soluble solution which is easily washed off with a hose or pressure washer. The end result is very clean and smooth wheels. On bodywork its worth spraying to see if metal particles are also present before claying as they are extremely sharp and may cause marring. They are most likely to be present if your vehicle is parked next to a major road or railway line, especially stations. Note that IronPRO may be diluted 2:1 with water. It is well known that the key chemical ingredient suffers from a fairly awful aroma which makes some similar products extremely noxious, but Race Glaze have managed to largely mask that with a pleasant fruit smell. Unlike some fallout removers Deironising Wheel Cleaner doesn't suffer with the same terrible odour issue. It has a slight citrus undertone. Apply to one wheel at a time and leave to dwell, reaction time was 3 minutes on fairly clean and sealed alloys and I was surprised at how purple my alloys turned so it obviously works well. Second alloy I applied and agitated with a soft bristle brush, this sped thing up slightly and possibly gave a slightly better clean. After a reaction occurs power wash off thoroughly and do not allow it to dry fully on you alloys before removal. "Excellent easy to use web site, products arrived in quick time, hope the rain stops soon so I can try them out. Once again Vertar delivered a first class service."